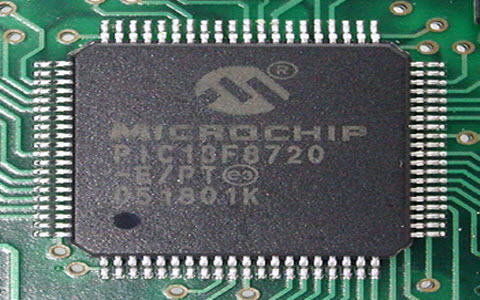 PIC Stands for Peripheral Interface Controller and first it was developed by Microchip technology in 1993. Since the day of the inception the PIC technology has been widely accepted and in the modern days they have been unavoidable. The PIC is very useful for the purpose like easy to interfacing with other peripherals, low cost, large user base and serial programming capability and many more. The microcontroller is a just like a microcomputer and it has been designed in such a way that it will function with embedded systems in motor vehicles, mobile radio transceivers, vending machines, robots, office machines, home appliances, complex medical and various other devices as well. As far as type is concerned, there exists many microcontrollers, however the most popular among them are Bits, number of input/output lines, supply voltage, Flash size, RAM size, packaging type, and speed. To be more specific they are the smallest microcontroller, but very useful to perform a large number of the task including the multitasking as well. Each of PIC has two components like register and the stack. Some of the main important features of the PIC are RAM, flash memory, PSP(parallel slave port), LCD, I/O Ports, USART, ADC (analog to digital converter), CCP(Capture/Compare/PWM module) ,Timers/Counters, EEPROM, ICSP (in circuit serial programming, SSP and the Comparator. So in short we can describe the PIC Microcontroller as the perfect combination of the RAM, ROM, CPU, supports the protocols such as SPI, CAN, counters and, and UART for interfacing with other peripherals and timers as well. The consistency aspects of the PIC microcontroller are wonderful and hardly have they showed any faulty. As the PIC Microcontroller works on the principle of the RISC architecture, it gives a very good performance compared to the others. The power consumption factor is the one which you cant ignore and the PIC consume very very less power compare to the other microcontroller. At the same time it can be programmed very easily and quickly with out any issue. 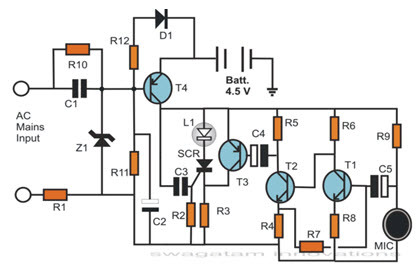 The interfacing of the analog circuit can be performed smoothly with out any aid of the extra circuit. When it comes to the PIC Microcontroller Architecture, we will come across the term like CPU, I/O ports, /D converter, timers/counters, oscillator and CCP module, memory organization, A, interrupts, serial communication. CPU: The CPU is the main storage unit and mainly it gives the algorithm support and in addition to that it is very useful for internal and external peripherals, control unit which is connected to the CPU and the accumulator is used for storing the results and further process. Memory Unit: The memory unit of the architecture is consist of the RAM, ROM and the STACK. RAM: Inside the RAM has two registered stack like Special Function Registers (SFR) and General Purpose Registers (GPR), Out of this two the GPR is mainly used for the purpose of multiplying and storing the numbers in other registers, whereas the special one used for a particular or special purpose not for the general purpose. ROM: The ROM used inside is useful in writing the program for microcontroller and saves it permanently, and finally the program is executed by the CPU so as to increase the performance. 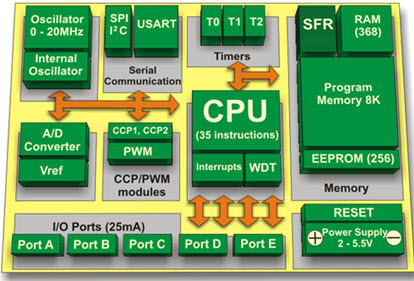 In addition to that the other timers/counters, oscillator and CCP module, memory organization, A, interrupts and serial communication has some key role in the PIC Microcontroller Architecture. 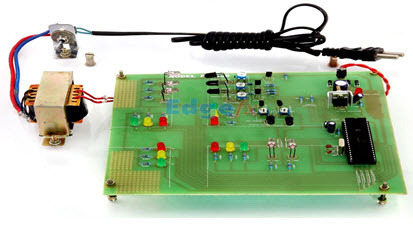 Doing an electronic project is always a mammoth task, however, if you are in search of a simple electronic project here we will guide you about the most simple 5 electronic project which will help you to complete your electronic project. Automatic Dark Sensor: You will find the relevant material over the internet. Dark Sensor using two Transistors: Here the experiment will be based on the sensor where there will be two transistors. Melody Generator using the UM66: yes, it is a very interesting topic to do the project. A Clap Switch: This is the most recent topic which you can opt for. Basic Remote Tester: This project will be based on the principle of infrared. The use of microcontroller in various sections has been increased in the recent time and popularity of the microcontroller has also been increasing at the same speed. In order to meet the demand of the industry several microcontroller projects are always welcome. Here are some vital clues and ideas which will help to pick your microcontroller project. In the automotive section you can go for projects like Multiple Relay Driver Circuit Method, Multiple Relay Driver Circuit Method and Induction Loop Car Detector. 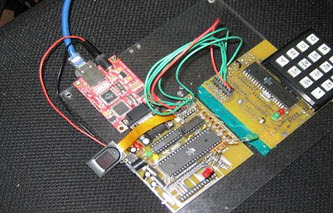 Electronic voting machine using seven segment multiplexing with 8051 microcontroller (AT89C51) and many more. The microcontroller is a fully functional computer and it is able to perform fairly simple task with a least possible time frame. Many of us called it as a standalone computer as well. The peripheral associated with microcontroller gives it the real power to perform the job. If you have been assigned to do a project on the PIC microcontroller, here is the list of project examples which will give you some idea about your project. The PIC microcontroller projects are Frequency counter, Dot matrix led controller, Inductance/Capacitance meter, Home security alarm, Universal Infrared controller, Seven segment Digital clock Servo controller, Metal detector and much more. One of the major problems faced by anyone in any metro city is the traffic congestion. Subjecting oneself to traffic congestions is a big nightmare for anyone living in a metropolitan city, and it is a big headache, especially for someone driving a vehicle in heavy traffic. Controlling the traffic of such a high magnitude is too difficult using outdated methods. This proposed system is enhanced to control the traffic using multiple microcontrollers. They communicate with each other via a serial communication. The goal of this project is to develop a synchronized traffic signal system which can be used to synchronize the traffic singles at the junctions in a metropolitan city where the vehicles once getting a green signal at one junction continue to get the same green signal at consecutive junctions. This happens through a serial communication to all the microcontrollers used in the network. The proposed system uses a microcontroller of the PIC16 series family and a rectified power supply. The number of LEDs interfaced to the microcontroller represents the traffic light signals. Each microcontroller is responsible for one particular junction. If the vehicles are assumed to travel at a particular speed at one junction, then the traffic signals change in the same way. Once the vehicle get the green signal at one junction, the same signal is maintained throughout the consecutive junctions by communicating with each microcontroller interrupt. The major advantage of adopting this technology is that, there is no need for any centralized body to monitor the direction of traffic flow. As human involvement is negligible, there will be a little scope of human error. Hence, this approach will be a boon for government and local authorities facing financial constraints as they can’t spend money on costly cameras and software. 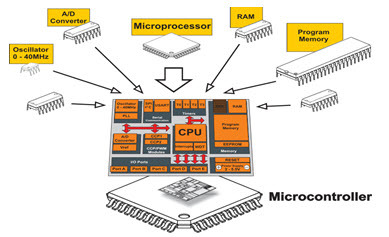 Thus, this is all about pic microcontroller architecture and its projects. We hope that you have got a better understanding of this concept.Furthermore, any queries regarding this topic or electronic kits please give your feedback by commenting in the comment section below.Here is a question for you, what are the applications of PIC microcontroller?